Over the past 2 years the media have saturated us with the sight and sound of human misery as refugees desperately seek asylum in Europe. Images of the bodies of small children washed up on shore have competed with pictures of sinking boats and squalid camps from Calais to Iraq. The UNHCR estimates that in the last 5 years around 60 million people throughout the world have been displaced due to war. This is the biggest number since the Second World War ended. Of course if you read the Daily Mail or Daily Express etc these people aren’t refuges fleeing war zones. They are just a “horde” of economic migrants aiming to steal our jobs, benefits and houses. The facts are different. Over 85% of those trying to get North are from areas devastated by war. 54% of the total come from Syria and most of the rest from Afghanistan, Eritrea, Iraq, Somalia and Sudan. 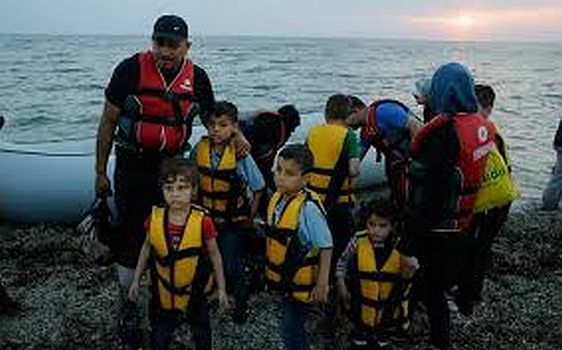 Syria alone has around 9 million “displaced persons” many within its own borders. Why is all this happening now? The forced movement of people all over the world (and not just to Europe) is caused by the generalised failure of capitalism. Global economic crisis and imperialist rivalry which has stepped up in the wake of that crisis have created hell in many areas of the planet. The destruction of existing state structures by western imperialism in Afghanistan and Iraq has opened up a Pandora’s Box which is now dovetailing into the debris of the Arab Spring of 2011. This was itself a consequence of the collapse of the financial system in 2008 which has had repercussions around the world. Nowhere is this clearer than in Syria. The chaos in Iraq left by the UK and US invasion has been mirrored by the support of Russian and Iranian imperialism for the politically and economically bankrupt Assad dictatorship. In this situation of capitalist failure many like the Assad regime will take up arms to defend the power and access to wealth they currently have, whatever the consequences for the population. Mix in the actions of the imperialist powers and you have ongoing misery for millions: indiscriminate and innocent victims of barrel bombings and drone strikes from all sides. And the conflict is spreading. ISIS (like the Taliban and Al Qaeda before them) are the unintended consequences of imperialist manoeuvring. First the dismantling of the Iraqi Army gave them thousands of recruits amongst the Sunni excluded from the US puppet state. Then the Saudis and Qataris financed them as Sunni fundamentalists to oppose both Iran and Assad. Finally, Turkey got involved by colluding with IS exports of oil to finance its troops as well as allowing everything and everybody to cross the Turkish border to the IS zone. The aim here was clear. IS were fighting the Kurds and this would prevent Ocalan’s PKK from causing much mischief in Turkey. Now both Turkey and Russia have an alibi for bombing campaigns. They pretend they have joined the fight against ISIS but in fact this is a cover for their respective attacks on the Kurds and Assad’s other opponents. All this means is that the armed conflict stretching from Syria into Iraq has now entered Turkey itself and a minor civil war between the PKK and the Erdogan Government already exists in Turkey’s Kurdish territories of the South East. As there are already 2.3 million Syrians in Turkey the prospect of more (including Kurdish civilians) fleeing the area is more rather than less likely. Like the US and Russia, Saudi Arabia, Turkey, Iran and even smaller imperialist players want to stick their fingers in the pie in the struggle for power and control in the Middle East. Beyond the Middle East armed conflicts continue in Afghanistan, Somalia, Sudan, Nigeria, the Congo and so on and all threaten to spread to neighbouring states. Imperialist wars are only part of the tragedy. Capital – via governments and corporations – is playing out the economic version of this tale. Just as an example, let us take the story of Eritrea – a major contributor of “displaced people”, adding hundreds of thousands over recent years. The media have little to say about the place. Nevsun, a Canadian corporation is involved in massive mining operations in the country, mainly for copper. Afewerki, the country’s President has a major stake in the mine (40%). He ensures that it is supplied with slave labour via national service which can last until the age of 50. The human rights abuses are commonly known – excessive hours, virtually no pay, no health and safety considerations, many people killed or seriously injured at work. Eritrea demonstrates that in an imperialist world national liberation is a myth. The Afewerki regime, like so many ex-colonial regimes, is simply the enforcer for globalised capitalism which does nothing for the basic economy where life for most people is centred on subsistence agriculture. This is generally being destroyed by the forced labour of national service. The mines serviced by this labour are controlled by the regime and international capital. Many migrants from other African countries have similar tales to tell. International capital is gradually destroying country after country, region after region within the disadvantaged areas of the world, mainly for the sake of mining and agri-business. It is the dispossessed of those countries who pay the cost but even here it is only a minority who can afford to risk the perils of the journey to Europe. Or rather non-response. European states have failed to agree on a policy to deal with a problem which has been staring them in the face for years. Only now when 2 million refugees are expected to arrive in Europe have minds begun to focus. But they are not of one mind because each of the member states of the EU is dominated by its own national interests. On the surface Merkel’s Germany is the most generous by accepting nearly half of all arrivals. In reality there is an element of calculation here. The refugees are not illiterate or unskilled. Many were well off and in professions in their country of origins. Those who manage to ‘take ship’ for Europe are lucky in many respects, having been able to raise the often $4-6000 demanded by people traffickers. Most had hoped that the local war would end and they could rebuild their lives. But after 4 years it was clear that war was spreading not ending. They stuck out the misery of the various camps in and around Syria but the Turks, for example, will not allow them to work and will not allow their children to go to school. These were the sort of refugees that appealed to Merkel’s government because they would increase the skills of the labour force at a time when the labour market was getting tight and they might have to pay more to the existing workforce. Of course this calculation is not understood by all, particularly those who are disposed to racism (primarily in the East). But racism will increase if more cities do like Hamburg which terminated the social housing contracts of their tenants to take on these presumably wealthier refugees. There is nothing like a bit of divide and rule for ensuring that workers fight each other rather than the bosses. The same schizophrenia can be seen in the UK with Teresa May talking tough about expelling migrants whilst the top bosses’ organisations assert they are vital for the economy. Whilst many states are looking to continue to deal aggressively with the issue – using police, armed forces, fencing, altering visa and asylum regulations and so on – the emerging consensus is that Europe should give financial and material aid to the camps in areas close to Syria etc. In the latest move they are trying to bribe Turkey into allowing Syrians a better life in Turkey. Given the problems in Turkey highlighted above there is not much chance of success here. In fact there is no capitalist solution since it is the very nature of the system which is creating the distress in the first place. Global inequality and wars stoked by imperialism in the pursuit of profit are all the current system has on offer. Only a world communist system can end this increasing misery. "The forced movement of people all over the world (and not just to Europe) is caused by the generalised failure of capitalism. Global economic crisis and imperialist rivalry which has stepped up in the wake of that crisis have created hell in many areas of the planet. The destruction of existing state structures by western imperialism in Afghanistan and Iraq has opened up a Pandora's box..." says the article above. This is all the fault of "the generalised failure of capitalism". Unfortunately few people seem to know this, or understand this, or be prepared to admit it. There is a generalised failure of capitalism and, as the article states, it is causing hell in many areas of the planet. Lucky are those of us who still live in zones which have escaped the hell so far, though even living under capitalism merely suffering a preliminary state of austerity, where welfare cut backs, unemployment and a generalised anxiety stemming from the precariousness of life rule the roost as yet unchallenged, is no fun. And hell could be lurking round the corner, just waiting the intensification of the crisis. So is there any hope? Yes, possibly! For if the generalised failure of capitalism has caused the biggest displacement of people since the Second World War, then presumably the time might come, and could even be lurking round the corner as an alternative to the bourgeois hell, when the working class might wake up to its own solution to this ever-spreading crisis and put an end to the misery of capitalism for ever. For only a world communist system can end this misery. Aurora is the broadsheet of the ICT for the interventions amongst the working class. It is published and distributed in several countries and languages. So far it has been distributed in UK, France, Italy, Canada, USA, Colombia.